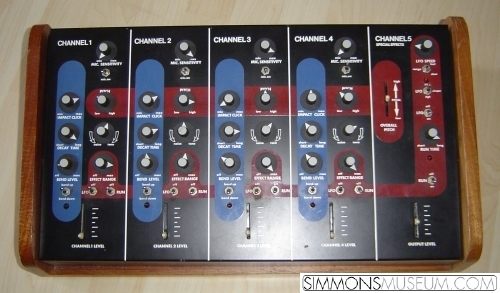 Together with its two channel variation SDS 4, the SDS 3 is - as far as I know - the first Simmons set that has been produced in series, manufactured under the label "Musicaid". As having been modern at that time, the SDS 3 appears in a wooden frame. The brain offers 4 drum channels. Each channel has separate filters for click, decay, bend, pitch and noise. Concerning the sound it is the predecessor of the later SDS 5 which ensured the later commercial success of the Simmons company. A fifth channel is a pure effects channel (I will offer some sound examples as soon as I will have dealt with it). On the back side of the device there are connections for a pitch pedal, a "kill delay" pedal to "cut" a sound, in- and outputs for microphones, single outs for each channel and a mix out. Not to forget the connection for the pads: The first pair of pads is connected with a standard midi cable, the second pair needs to be connected to the first pair using a standard 6.3mm (1/4") stereo jack cable. Each channel, effects channel included, offers a separate fader to adjust its gain.